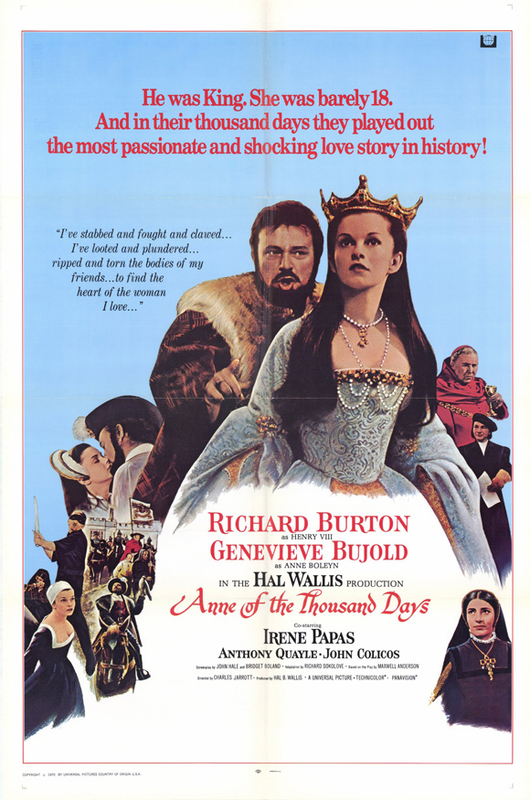 Based on historical fact the setting is 1527 King Henry VIII (Richard Burton) is bored with his current wife Catherine of Aragon (Irene Pappas) and becomes intoxicated by the beauty of 18-year-old Anne Boleyn (Genevieve Bujold). Initially she resists the advances of the King and finds him unappealing, but once she gets a whiff of all the power that being a Queen can give she falls in-love with him. The King wants her to bore him a son, but their first child turns out to be a girl, which causes their marriage to sour. Their acrimony is furthered when their second child turns out to be a stillborn son. Eventually the King grows tired of Anne and hires Thomas Cromwell (John Colicos) to find a way to get rid of her. Cromwell tortures some servants into saying they had sexual liaisons with Anne which gets her placed under arrest and awaiting trial and execution. Bujold gives a powerful and mesmerizing performance and I am surprised that she didn’t win the Oscar. However, Burton, who is an actor that I admire, seems uncomfortable in his role and just walking through his part. The story itself is compelling and because it is based on fact makes it all the more amazing. It moves along at a good pace and the viewer can’t help but get absorbed in it. This is no stuffy costume drama and it is probably tawdrier than any soap opera out there. However, Charles Jarrot’s direction is a bit stale. The sets and costumes are great, but the atmosphere and cinematic style is missing and the whole thing seems too much like a filmed stage play. My biggest quibble with the film is that it doesn’t stay completely accurate. Historians insist that the King does not offer Anne any type of reprieve nor does he visit her after she is imprisoned like he does here. While this scene is nice because it does humanize him who in every other way is despicable it doesn’t help the viewer better understand the story or the people in it by inserting something that really didn’t happen.